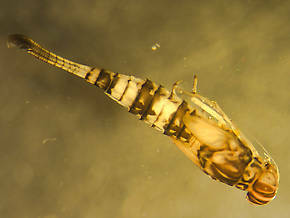 Trout may feed well on the tiny nymphs during a hatch. Caucci and Nastasi discovered and noted in Hatches II that these nymphs, despite their excellent swimming ability most of the time, become nearly immobile shortly before hatching. They slowly crawl out of the water or dead-drift (Dead-drift: The manner in which a fly drifts on the water when not moving by itself or by the influence of a line. 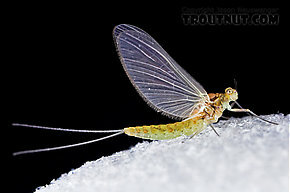 Trout often prefer dead-drifting prey and imitating the dead-drift in tricky currents is a major challenge of fly fishing.) float to the surface, buoyed by gases they release. According to one source, the duns crawl out onto shore to emerge. Procloeon duns usually molt into spinners, mate, and die the very day they hatched. Dun and spinner activity may overlap. They either prefer fertile, weedy spring creeks, or slow, silty stretches of relatively warm trout rivers, depending on which books should be believed.